And yes, we are “fed up with Washington and convinced more than 3 to 1 that the nation is heading in the wrong direction,” yet there’s “confidence that there will be better times ahead, that the classic American dream endures and hasn’t been extinguished. It’s not even at its low ebb.” Why? Because we’re in denial! Bond investors enjoyed stellar gains for several years but that’s about to end, says Kurt Brouwer, chairman of Brouwer & Janachowski and editor of MarketWatch’s Fundmastery blog. 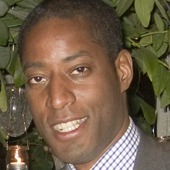 He talks with Money & Investing Editor Jonathan Burton. Do Main Street’s 95 million investors know something Warren Buffett’s long-time partner, Charlie Munger, doesn’t know? Munger is warning us “It’s Over” for America. Yes, “o-v-e-r,” America’s in decline, at the end-of-days, coming to “financial ruin,” says Munger. Optimism has always been the enduring spirit that made us a great nation, brought us back from overwhelming challenges and impossible odds — WW II, the Civil War, the 1776 Revolution. Yes, that spirit still burns in our soul, says the poll. But we also know, as we said earlier in “The Death of the Soul of Capitalism,” that over the long-term, through many centuries, historians give nations an average of about 200 years before they burn out. Why? Because the “blind optimism” that makes a nation great in the early years of its rise to power and glory becomes, paradoxically, its worst enemy in the end-days. Their arrogance traps them in a self-sabotaging cycle that weakens their resolve, makes them vulnerable to new, unpredictable challenges, ultimately destroying them from within. That happens over and over throughout history, even as their optimistic brains tell them they’re still the greatest. Turns out that like Buffett, whose tales we detailed earlier, Munger’s a good storyteller. His parable, “Basically It’s Over: A parable about how one nation came to financial ruin,” appeared in Slate magazine. Clearly he’s warning about the end of capitalism, the end of democracy, the coming end of America. In his parable Munger calls America “Basicland … rich in all nature’s bounty.” In our recasting it as a drama, we’ll use “America” rather than “Basicland” in the narrative to drive home the full impact of Munger’s powerful message. Significantly, Munger says 2012 is the turning point, a signal, the moment setting up the final crisis scene. We’ve often made a similar timing prediction, one tied to the 2012 election, and a reminder of the warning made by Jared Diamond in “Collapse: How Societies Choose to Fail or Succeed.” In the late stages of a nation’s cycle: A crisis hits. Everyone, leaders and citizens, act surprised. But it’s too late: “Civilizations share a sharp curve of decline. Indeed, a society’s demise may begin only a decade or two after it reaches its peak population, wealth and power.” Just 20 short years to ruin? Munger warns: “Even a country as cautious, sound, and generous as America could come to ruin if it failed to address the dangers that can be caused by the ordinary accidents of life. These dangers were significant by 2012, when the extreme prosperity of America had created a peculiar outcome: As their affluence and leisure time grew, America’s citizens more and more whiled away their time in the excitement of casino gambling.” Yes, Main Street “feels battered” while Wall Street gambling casinos generate billions. Munger’s also not talking about just the million or so gamblers working in Wall Street’s “too political to fail” casino-banks. No, “gamblers” are also among Main Street America’s 95 million average investors, though most of the high rollers are the slick pros on casino payrolls where “most casino revenue now came from bets on security prices under a system used in the 1920s.” Think of Goldman’s trading operation that often makes $100 million profits daily, while America has close to 20% underemployed. Now comes the crucial turning point in Munger’s crime-thriller: “Many people, particularly foreigners with savings to invest, regarded this situation as disgraceful. After all, they reasoned, it was just common sense for lenders to avoid gambling addicts … They feared big trouble if the gambling-addicted citizens of America were suddenly faced with hardship.” They were right. “Then came the twin shocks,” a plot twist borrowed from “Avatar,” “Wall-E” and Al Gore, the kind of shocks that most “optimists” (especially those hell-bent on voting Obama and the liberals out of office by 2012) always deny. So, “hydrocarbon prices rose to new highs.” Munger must mean a twist like oil hitting a scene-stealing $1,000 a barrel. Though Munger and his partner got rich in this bizarre parable, his plot turns dark as America’s “investment and commercial bankers were hostile to change. Like the objecting economists, the bankers wanted change exactly opposite to change wanted by the Good Father.” Wall Street “came to believe that the Good Father lacked any understanding of important and eternal causes of human progress that the bankers were trying to serve” by leaving today’s free market gambling casino operations untouched, so it could quickly return to pre-2008 “greed is very good” reality. Scene 10: Politicians love Wall Street’s derivative casino: Game over! The 86-year-old Munger is himself a metaphor for America’s version of the classic historical cycle: He was an optimist as he and Warren built their $267 billion company over four decades. But sadly, his parable, his vision of America’s future, has no optimistic finale. Rather it’s reminiscent of Diamond’s “Collapse,” Bogle’s “Battle for the Soul of Capitalism,” and so many other recent reminders about how America just went over a cliff and how Wall Street’s casino-banks will soon drive us off a bigger cliff into the Great Depression II by 2012. Munger’s parable is more than a Hollywood suspense-thriller, it’s another example of the classic historical life-cycle of a nation. Epilogue: Your moral dilemma: a no-win scenario or historical destiny? Do we really have a choice? Ask yourself, what’s ahead after 2012? Can you see beyond a destructive campaign: Obama at war with Palin and the “Tea Party of No?” What are the long-term prospects of our “civilization.” Do you share Munger’s dark vision? Or does the USA Today/Gallup Poll tell you guys like Munger, Buffett and Volker do “lack any understanding of important and eternal causes of human progress that the bankers are trying to serve” with their gambling casinos. “Optimists” in those polls are just politicians, bankers and citizens like you, in denial, can’t hear the warnings. So we get no changes, no action, no preparations because at this stage in the long-term historical cycle, optimism has turned into our worse enemy, wishful-thinking. Solution? Get into action, let’s launch the “Second American Revolution.” Got any constructive, optimistic strategies? Share them. Add your comments. On April 24, I wrote Let the Criminal Indictments Begin: Paulson, Bernanke, Lewis. You will be pleased to read Ex-BofA chief Lewis charged with fraud. New York Attorney General Andrew Cuomo said Thursday it was bringing civil charges against senior Bank of America (BAC) executives, including former company CEO Ken Lewis, for their role in the company’s controversial purchase of Merrill Lynch. Cuomo’s office, which has been aggressively pursuing an investigation into the merger and subsequent bonuses paid to former Merrill employees, said it was charging Lewis and Bank of America’s former chief financial officer Joe Price with fraud. The lawsuit contends that the bank’s management team understated the losses at Merrill in order to get shareholders to approve the deal, then subsequently overstated the firm’s willingness to terminate the merger to regulators weeks later in order to get $20 billion of additional aid from the federal government. It is a phrase that should resonate through much of the industrial world, where high and long-standing unemployment is increasingly becoming a huge domestic political issue. Speaking on a panel at the annual meeting of the World Economic Forum in Davos, Summers said one in five American men aged 25 to 54 are unemployed. He said given a “reasonable recovery,” that rate could improve to one in seven or one in eight. That still contrasts with a 95% employment rate for that group in the mid-1960s. 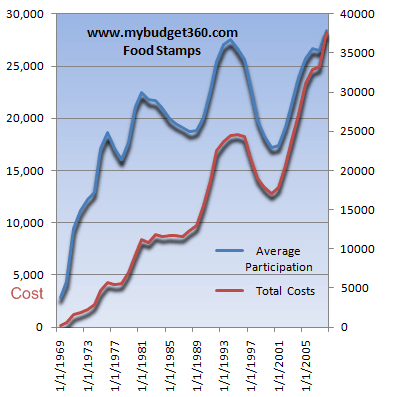 JAN-28-2010 – Game Over for the American Middle Class – Inflation Adjusted Wages up 20 Percent in Last 20 Years While Housing Costs are up 56 Percent and Healthcare Costs are up 155 Percent. The struggle for average Americans to keep up is largely becoming an act of will power and force in this current grand recession. Now you wouldn’t think that there is a definite war raging against the middle class if you simply follow the mainstream media but the facts speak to a more distilled and corporatized method of debt slavery. Americans are working more hours trying to stay in the same place that they believe would keep them on pace to having the American Dream. And this dream is merely the ability to afford a home, provide your children with a good education (public or private), and save enough to have a retirement that doesn’t require you to eat cat food after a lifetime of working. That is at the root of what most average Americans would want after a full working career. Everything is relative in this world. Incomes have gone up during this time but the cost of housing, healthcare, and access to education have outpaced income gains in some cases by four to one. Money is only worth what you can buy with it. The grand housing bubble of this decade lured many into buying homes that they simply could not afford. Banks and Wall Street were more than willing to provide access to this dream since they knew if all bets crashed, and they did, that they would call on their connected politicians to bail them out and send the bill to taxpayers for their adventures in finance. Take a look at the chart above closely. Housing price changes have wiped out any gains in income. The relative amount of income needed to buy a home has put many two income households on the brink of bankruptcy. And the 4 million foreclosure filings in 2009 alone tell us that many Americans are unable to hold onto one cornerstone of the American Dream. The middle class is absolutely vital to having a sustainable and flourishing economy. The massive debt machine coming from the big banks has created a new form of debt servitude. Some would argue that this is a personal responsibility issue and I will be the first to agree with that. People should live within their means. But think of the FICO score that has become like a permanent financial report card. Some employers actually screen for credit scores before hiring applicants. Want to rent a home because you don’t want to over extend and buy a home? You better hope that FICO is up to par. And many insurance companies base their analysis on this score. So even if you never had a credit card or any debt, you would be in a bad spot because so many people rely on this number. This is only one example of how people are actually forced to use debt simply to pursue the avenues of the middle class. I sometimes read gut wrenching stories from the Great Depression where people would wash and reuse paper towels or have soup for weeks on end just to keep their families fed. 37 million Americans would be one step away from that existence if it weren’t for some basic safety nets. It is troubling to say the least that this patch is what is keeping this great recession from being a profound depression. Yet I think the 27 million underemployed Americans are already in that state of mind. The idea of a middle class life is slowly drifting away as each and every day we realize that our nation is becoming more of a corporatacracy. The housing nightmare really played on both ends of this middle class dream. Banks were more than willing to lend trillions of dollars to people that really could not afford the homes they were buying. This created the biggest housing bubble the world has ever witnessed and the bursting ramifications are being felt throughout the economy. Yet if you look at the equation, who is really being punished? 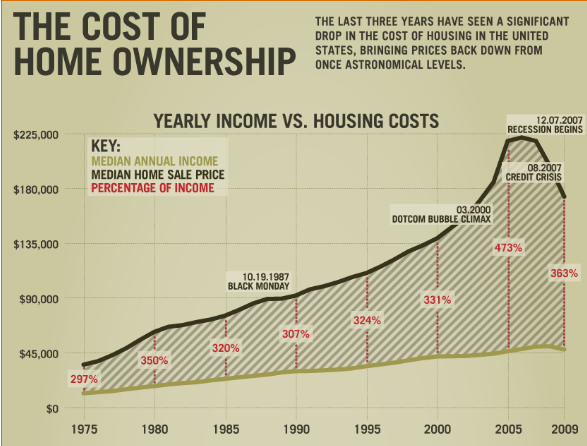 Average Americans are being punished as they have their homes foreclosed on. Yet banks who are in the supposed position of financial experts, have not only garnered trillions in bailouts but are now back to their speculative ways. This is disturbing because it is highlighting a marked shift and a near game over for the middle class. Think of the rise of our economy in the 1940s and 1950s. Many returning GIs had access to affordable education through new programs and grants. It is the least you can offer to someone defending this country. Next, it was possible to support a family with one income because we had a strong and sustainable manufacturing base. Now, we have families with two incomes in the service sector trying to piece things together. Throw in a child, and that second income evaporates through childcare costs and educational fees. In other words, just because people have more income their buying power has collapsed. This being the biggest budget item for most households, you would assume that lower prices would be welcomed from the government seeing that many Americans are underemployed and those with jobs have seen stagnant wages. The middle class dream is at risk. This is a question of what we want out of our country. Are we simply obsessed on keeping home values inflated so banking giants could keep gaming accounting rules and claim billion dollar profits? If we want to prosper in the next decade, there will need to be a radical change to preserve what once was envied by the world. Otherwise, you can expect banks and their political allies to keep selling away the middle class of America. 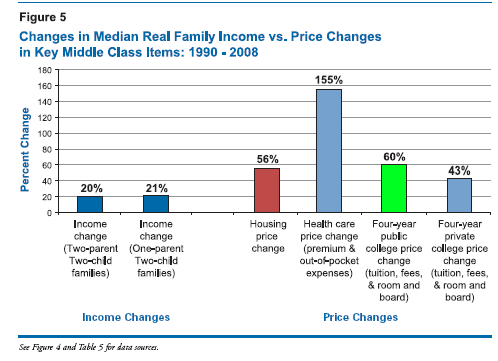 On the path we are traveling on the middle class is largely at risk for a big game over in the next decade. Washington, January 18, 2010 — In an interview with Dina Gusovsky of Russia Today, Webster Tarpley pointed out that the escalating clash between Google and the People’s Republic of China comes in the context of rapidly deteriorating relations between the two countries on a broad front. Google is part of a cartel of Internet companies which notoriously works closely with the US intelligence community for political purposes, including the subversion and overthrow of foreign governments. We need only recall the central role of Twitter in the CIA’s attempted coup d’état in Iran last summer. Political manipulation by means of the Internet is an indispensable part of the CIA’s recipe for color revolutions, velvet revolutions, people power coups, and postmodern coups. When the Internet is introduced into previously authoritarian countries, it is often possible to dupe, manipulate, and stampede large numbers of enthusiastic young people who are not politically sophisticated. The results are often disastrous. In Georgia, a color revolution installed into power the madman Sakaashvili, who has already started one war. Yushenko, the beneficiary of the Orange Revolution of 2004, has just been massively repudiated by voters after a catastrophic presidency. The hangover of disillusionment surrounding Obama is related to the fact that he took power in something of the same way. The Chinese government therefore feels that there are valid reasons to prevent Western intelligence agencies from massively pumping black propaganda into China using the Internet. This is in any case a purely domestic Chinese issue, and Americans in particular ought to focus on putting their own house in order before starting to give lectures to the rest of the world. On the morning of January 4, it was reported by the Los Angeles Times that the Great Firewall maintained by the Chinese government to filter Internet content had momentarily come down. Was this the handiwork of the United States, or did China believe that it was the handiwork of the United States? About 10 days later, Google, Adobe, and Northrop Grumman accused Chinese hackers of entering their sites to gather information. The Chinese government has informed Google if they insist on violating Chinese law, they cannot continue to operate, and Google has announced their imminent departure from the Chinese market. Rumors of espionage swirl around the Google offices in China. Many press accounts allege that Google is opposed to censorship in principle. This is pure baloney. Google supports censorship to the extent that it is dictated by the United States intelligence community. Analysts and researchers delving into questions about the September 11 attacks or the London 7/7 bombings of 2005 are familiar with the many ways that Google attempted to hinder public access to facts and analysis that were not part of the official narrative. Google has been fundamentally hostile to anyone criticizing the US government official versions of these false flag terror provocations. To say that Google is opposed to censorship is therefore monumental hypocrisy. US-Chinese relations are now rapidly deteriorating towards a new Cold War or something worse. The entire foreign policy of the United States is strongly motivated by anti-Chinese considerations.Pakistan is targeted for destruction in large part because it could function as an energy corridor between Iran and China, to the benefit of the latter. What is done by the United States inYemen, Somalia, Sudan, Zimbabwe, Burma, and many other points across the globe is fundamentally dictated by a desire to checkmate China. The news is that China is fighting back far more effectively. At the recent Copenhagen climate change conference, the basic strategy of the US and the British was to use the big lie of global warming to institute a world carbon dictatorship which could then be used to strangle the economic development of China, India, and other developing sector nations. As accounts in the British Guardian have pointed out, Chinese Prime Minister Wen directed a successful blocking operation with the help of countries such as Sudan, Venezuela, Cuba, Bolivia, and others, personally snubbing Obama several times in the process. When it comes to sanctions against Iran, the Chinese are signaling that they will block them in the UN Security Council, and they are also circumventing them in various ways. China has now passed Germany to become the world’s largest exporter, and is estimated to possess about 2.5 trillion dollars of foreign exchange, much of it denominated in dollars. A trade war between China and the United States over such issues as tires and steel is now a distinct possibility. The US is keeping up a ceaseless whining about the alleged dirty float of the Chinese currency unit, the renminbi. The US is on the verge of a major arms sale to the Republic of China on Taiwan, something which Beijing is bound to oppose. Even worse is the visit of the Dalai Lama to Obama’s White House, which is now reported as imminent. The Dalai Lama, although lionized by a gaggle of Hollywood degenerates, is in fact a notorious Western intelligence asset who was the figurehead of a brutal regime of feudal oppression which kept the majority of the population as serfs and a significant minority as slaves. The United States government continues to transfer significant sums of money to the sinister Rebiya Kadeer and her “World Uighur Congress,” which the Chinese government accuses of being responsible for the murder spree in Xinjiang province (Chinese Turkestan) in July of 2009 for which two dozen death sentences have now been handed down. A British citizen accused of functioning as a drug pusher has just been executed by the Chinese, who have not forgotten the three Opium Wars waged against them by London for the purpose of forcing deadly narcotics onto the Chinese market.